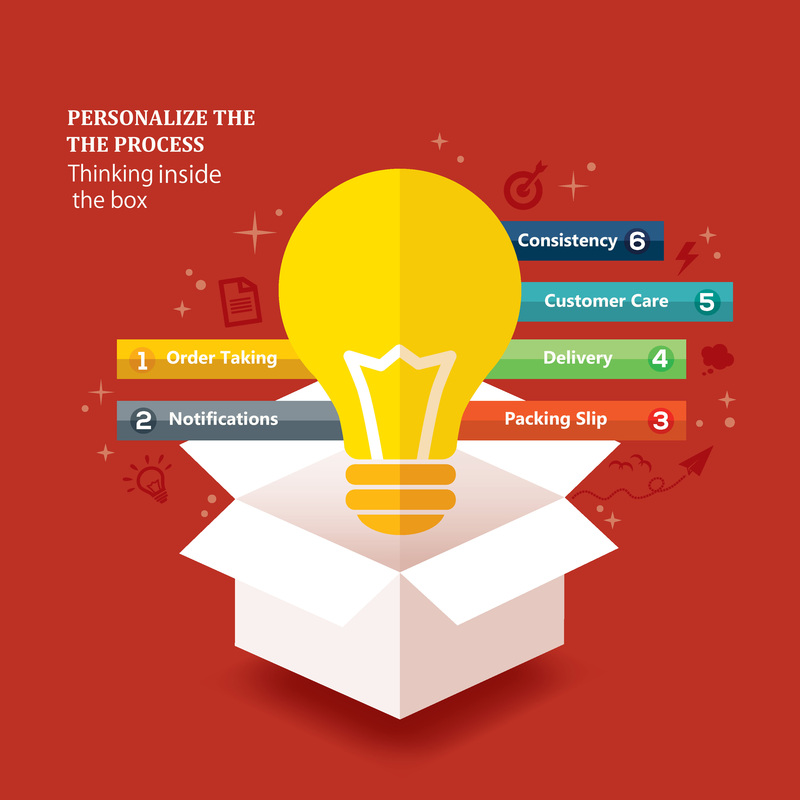 Add some “wow” factor to your delivery process. Many times the personalization ends when the order gets placed. The mundane, informative email loaded with numbers, disclaimers and directions kicks off a process of waiting for that cardboard box to arrive. Why not use this time as an opportunity to “wow” the customer as well? When the order is complete, that’s when the customer’s excitement soars as they anticipate holding that brand new item for the very first time. They’re anxious to know when it will arrive. Don’t make the mistake of losing touch with the customer after they buy; instead, continue to customize the journey until the product is in-hand. Here, we highlight 6 ways you can tailor the order fulfillment experience in an effort to make a stronger connection with your customer. 1) Order Taking: The first question you should ask yourself is “Am I letting my customers order in a way that’s comfortable to them or am I forcing them into my sales funnel because it is easy and effective for my business? If you answered ‘yes’ to question two, you just might be costing yourself sales. Take a look at the processes for how you take orders and be sure the options make sense for your specific customer’s needs. 2) Notifications: Marketers know that once that “submit order” button is pushed; the countdown is officially on. The anticipation to receive the product will grow by the minute. Staying in contact with your recent buyer is key, and this can easily be done via notifications for fulfillment of the order and shipments. Unfortunately, many marketers view these as an afterthought and don’t place much attention on their delivery. You’ve all seen them, right? The cryptic, text-rich email outlining the order details and loaded with numbers and disclaimers. Does it serve a purpose? Sure it does! But it is also a lost opportunity. Think of it this way: You head into a store to buy a new tablet. The first Salesperson (we’ll call him Bobby Basic) rings up your new order and says in a monotone voice, “Have a nice day.” The second Salesperson (let’s call her Patty Personal) scans your item and thanks you for coming to the store. Patty then proceeds to show you some amazing new apps that you can consider after launching your new device, she recommends some additional accessories to consider in the future and offers a coupon code (for VIP customers only) to redeem those items. If you’re the customer, who do you choose? 3) Packing Slip: Say goodbye to your black and white, information-only packing slip and say hello to a four color, brochure-quality piece combining transaction info and company eye-candy. Lead a new purchase off by adding “Thank you Sally for the Order” to grab your customer’s attention or throw in a “may we suggest that you try product xyz?” complete with splashes of color and imagery. The small cost to personalize the experience can be made up easily by adding repeat orders or simply by avoiding a return. 4) Delivery: Once the product ships, give the controls to the customer and allow them the option to modify the order. If you ship with a supporting carrier, this unique option can come in to play. Take the My Choice Program from UPS for example. This allows the customer to change the delivery date or even location of the delivery, all for a reasonable charge that is billed to their My Choice account. The marketer does nothing more than ship in a way that the customer can later control at their option, and consumers who use the service will be glad that you made it possible. 5) Customer Care: Don’t think of this realm as a cost center. You have a customer on the line. Even if it’s for a negative reason, this is a time to strengthen a bond. Invest in training and turn customer calls into new sales and increased lifetime value. Do this by knowing who is calling and following a script tailored for that type of customer. If you offer continuity programs, make a great connection with your customer by personalizing them as needed. Don’t have the attitude of, “this is what we offer.” Instead, create a customized continuity model that works for your customer. Though complex, a good back-end provider can manage this custom approach for you. 6) Be Consistent: The best thing you can do to personalize the back-end functions of order fulfillment is keep the message, look and feel consistent. A turnkey fulfillment partner can help achieve this. Communication is not only streamlined by having less entities in the mix but it’s also more consistent. Take some time to evaluate the order fulfillment process for your product or company. Are there functions or systems on autopilot? Where might there be opportunity to shake things up and surprise and delight your customer’s shipping experience? Sure, it could take some time and effort. However, if you take the time to do it well, you could be on your way to developing even deeper connections with your customers.